Why is my car misfiring on and off? It usually takes 15 or so minutes to misfire. Sometimes it never misfires for 300 miles. I've worked on this for a year now trying to find the cause. But the key to this puzzle is it's very intermittent but can be very stubborn. Usually starts at a red light then goes away once I get up to 35mph+. Or it... show more It usually takes 15 or so minutes to misfire. Sometimes it never misfires for 300 miles. I've worked on this for a year now trying to find the cause. But the key to this puzzle is it's very intermittent but can be very stubborn. Usually starts at a red light then goes away once I get up to 35mph+. Or it just stays at any speed and goes away at a red light. It's so random. Nothing seems to control the misfire. It just misfires whenever it wants. But always starts up fine. And there's no other issues going on with the vehicle. My emissions test were great. The misfire feels like one cylinder or maybe two on the bad occasion. It's an i6 4.0L 93 jeep. My biggest question is if something's broken or worn out why doesn't it misfire all the time. What would cause a random intermittent misfire and also cause it to drive perfectly fine 70 percent of the time? It'll take some troubleshooting to come up with the cause; Have the battery checked and the alternator checked. A weak battery or alternator will give a weak spark and misfire. Worn out spark plugs will misfire, and not always constantly. There's other possibilities and I'll let others fill in the list. Mine developed arcing at the coil. Needless to say if those are the original plug wires they should have been replaced LONG ago. A fuel injector could be failing or the computer driver. Given the age of the truck, you may have a sticky valve or heat soak issues causing some electrical devices to act up when hot. The intermittent nature of the problem is a pain to track down but you can try to eliminate any possible issues such as bad valves by doing a compression/leakdown test....PSI values should be within 5% between highest and lowest readings. Run some Top Engine Cleaner per bulletin to cleanup sticky valves/carbon buildup. Check for vacuum leaks or air intake leaks...loose or broken hoses..., check for loose or corroded connections for sensor wiring, run a fuel pressure test to check for a weak pump, test the TPS for smooth voltage readings as the throttle is opened from closed to fully open...erratic readings in spots mean the TPS is bad and can cause misfires, test the O2 sensor for good readings/wiring issues, etc..
Jeep had a TSB on heat soak issues for some of the 4.0 engines usually affecting #3 cylinder...installing a heat shield around or below the injectors. Some guys wrap them with high temp asbestos shielding used for plug wires/header applications. Heat soak can also affect electrical items like ignition coils, modules, crank or cam sensors, etc.. which may cause them to act up when heated up and cause high resistance in sensors/items leading to misfires. Also check for good grounds for the cam/crank sensor or other engine grounds which may cause intermittent problems if corroded or loose. Check for any vacuum leaks ...especially PCV or EVAP purge solenoid/EGR, etc.. A sticky EGR can also cause misfire issues....check and clean the EGR/passages. Change your plugs and wires, plus a new distributor cap, Good to go. I'm going way out in left field to suggest a sticking valve, based on the intermittent nature and getting better when the engine has been revved. Pity it is a '93 so you can't tell from the OBD which cylinder is misbehaving, but if you can get it to misfire for a minute or two a point-and-shoot infrared temperature gauge would show which cylinder had the coolest exhaust manifold branch. The true test is a compression check as thebax2006 suggests, but catching it in the act will be difficult. If you are not using synthetic oil, using it at the next oil change often helps sticking valves. Your symptoms point to something non-mechanical. Sticking injector. Injector driver or injector circuit integrity. Check the connections. Plug wires, plugs, distributor cap and rotor. It is a 93 Jeep. Does it even have injectors? May be a hair line crack in one of your spark plugs. If so, the best way to find it is to replace all of them at once! What's the compression on each cylinder? Do all the fuel injectors have the same resistance when you ohm test them? Have you pulled the valve cover and looked for a broken valve spring? Have you checked for wear on the camshaft lobes? If all that checks out you may have a bad driver in the PCM for an injector. 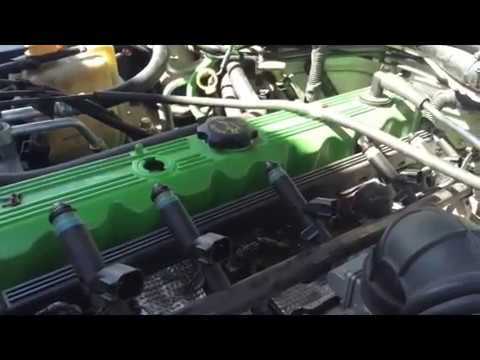 Before wasting too much time on an old motor that you've been driving with misfires for over a year I'd drop the oil pan and see if the crankshaft and connecting rod bearings are junk from gas diluting your oil. Replace the plugs, wires and coils or coil pack. What does car misfiring mean? Why does my car misfire? Misfiring car??? is it misfiring? Why is my car misfiring? HOW DO I CHECK THE BATTERY VOLTAGE USING A VOLTMETER?